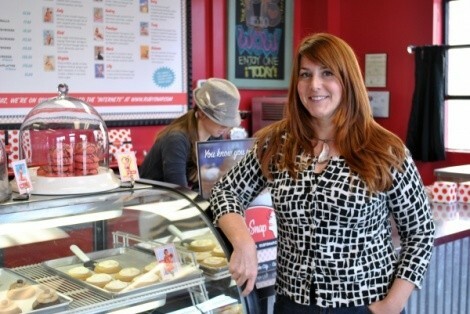 Local RubySnap bakestress Tami Cromar has attracted national attention, some negative—from Pillsbury, over her former My Dough Girl name—but mostly positive, passionate devotion to her adventurous gourmet cookies. It’s been almost two years since the Pillsbury dust-up, so City Weekly caught up with Cromar to find out what she’s been cooking up lately. Which cookie cliché fits you the most—tough cookie, smart cookie, “that’s the way the cookie crumbles”? I would say tough cookie—I’m a tough cookie. I’ve just been through so much the past three years, and I’m pretty resilient. I just keep pushing forward. What’s life been like post-Dough Girl? I feel like we’ve completely recovered, emotionally and financially. It was a pretty big deal. I decided that you choose your demeanor. You can choose happiness, and I just chose to let it roll off my back. We recovered from our rebranding, we’re almost 100 percent there, and people don’t grill me with questions as much, which is good because I got tired of talking about it. I wanted to be RubySnap, I didn’t want to be the girl who got sued by Pillsbury. I did have a customer who was super, super angry. I was doing samples at Whole Foods, and they practically wanted to punch my lights out because they thought I had copied the Dough Girl. What’s been happening since 2010, when we last talked with you? We do the Farmers Market every summer, and of course the holidays are insane. We have a store in Midway now, and we’ve expanded a little bit with Whole Foods, and we hope to be in Harmons by the end of February, in the freezer section. We actually built a really beautiful store in Heber. But it was tiny, and The Store in Midway came to us and said they would like a complete RubySnap store inside of their store. I didn’t feel the valley could sustain two RubySnaps since they were so close to each other, so we shut down our Heber store and moved over to Midway. We actually have a complete RubySnap there, so you can purchase all of our baked cookies, and shortly you’ll also be able to purchase our frozen dough. You switched from an LLC to an S corporation. What does that mean? I’m the only owner of RubySnap. LLC is a limited liability corporation, so you’re the sole proprietor, and you’re vulnerable. I wanted to be less vulnerable. Now that I’m incorporated, I’m required to take a salary, so I took my first paycheck in January 2012. We’ve been a business for three years; I’ve been in this building since February 2008. Everything has always gone back in to growing RubySnap. It’s kind of nice to finally reward myself. But it’s worth it. When you love it, you don’t really care. Money’s not my motivator. Is there anything you’ll never put in a cookie? Probably. The fans were asking for a certain ingredient … bacon. I was just like, “No way, no how, never,” because I just felt like it was such a fad. But then a radio station in Oregon received a box of our cookies and were bragging about it, and they said, “Now if we could just get her to make a maple bacon cookie, then we would be on top of the world.” So I did, and it was actually really, really good. I used the bacon fat instead of butter, and we used maple in the dough. It was really good, but I can’t stand the smell of bacon, making it fresh. So I just did that for fun. And that’s the one thing I thought I would never do, a bacon cookie. What’s something you’d like to put in a cookie but haven’t yet? There is a flavor that I’ve been dying to make. I want to make a browned butter mizithra with rosemary lemon pear glaze. I’ve been thinking I’ll been doing that in October. I’m dying to be creative again and stop being so business-oriented. I think this year you’ll see a lot of new creations come out of me. I have a million ideas for shortbread, so we’ll probably have some hip and cool shortbreads coming out, like a pistachio rose, or a curry currant. I made a lavender one that was really good. I’m just excited to create, because in 2011 I was stalled a little in creativity. 2011 was a lot of … not growing pains, but growing up pains, in the realities of business management. Your coffee Kahlua tiramisu cookie, Josephine, was the official cookie of Sundance. What celebrity were you most excited to meet? I was most excited to meet Will Ferrell, but he actually canceled. I was excited to see one of the granddaughters of the Kennedys. She did a film on her grandmother Ethel. It talked about how at the dinner table, they would go over current affairs, and if you sat at the far end of the table, you’d better be up on your current affairs because somebody had probably taken your subject. I wasn’t very much of a stargazer this year, I was really in working mode. Also my favorite thing at Sundance is Coffeehouse Music. I was able to serve cookies to Collective Soul and Matchbox 20. It was low-key for me. I was working and I was also launching with Park City Whole Foods at the same time, so I was really busy. Are there any secrets from your past, before you started RubySnap? I did investment banking in the ’80s, public and municipal finance, and then in the early ’90s I decided I wanted to get a new degree, and I got a degree in architectural design and I did that for 15 years. Designers are notoriously poor, so I would supplement my income making chocolates. I made chocolates for 15 years, which was kind of my true love. I love to cycle. I rock on the road. I can cycle really fast. I have strong legs, so I like to cycle 100 miles at a time. I have three daughters. My oldest is 20, and that sometimes surprises people. How much time would I have to log on the treadmill to burn off a dozen RubySnap cookies? A dozen?! How about … 20 minutes for one.